Barstool. Steel tube frame Ø 50 mm with self-supporting base Ø 35 cm epoxy painted semiopaque black with chromed foot-rest or complete frame in satined stainless steel. Padded seating with leather upholstery. 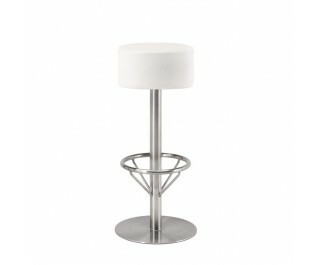 Available also with base Ø 20 cm to be fixed on the floor.